I can conclude that my data have a multi-modal distribution? @NickCox has presented an interesting strategy (+1). I might consider it more exploratory in nature however, due to the concern that @whuber points out. Let me suggest another strategy: You could fit a Gaussian finite mixture model. Note that this makes the very strong assumption that your data are drawn from one or more true normals. As both @whuber and @NickCox point out in the comments, without a substantive interpretation of these data—supported by well-established theory—to support this assumption, this strategy should be considered exploratory as well. This suggests it is extremely unlikely you would find data as far from unimodal as yours if they came from a single true normal distribution. #     Min. 1st Qu. Median     Mean  3rd Qu. Max. 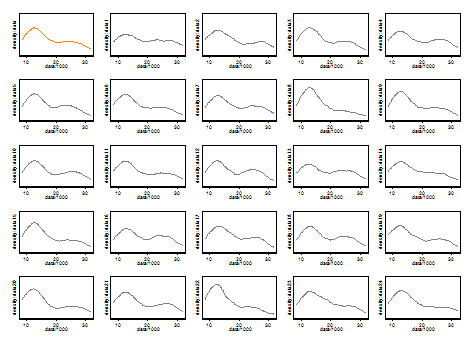 The summary statistics, and the kernel density plots for the sampling distributions show several interesting features. The log likelihood for the single component model is rarely greater than that of the two component fit, even when the true data generating process has only a single component, and when it is greater, the amount is trivial. The idea of comparing models that differ in their ability to fit data is one of the motivations behind the PBCM. 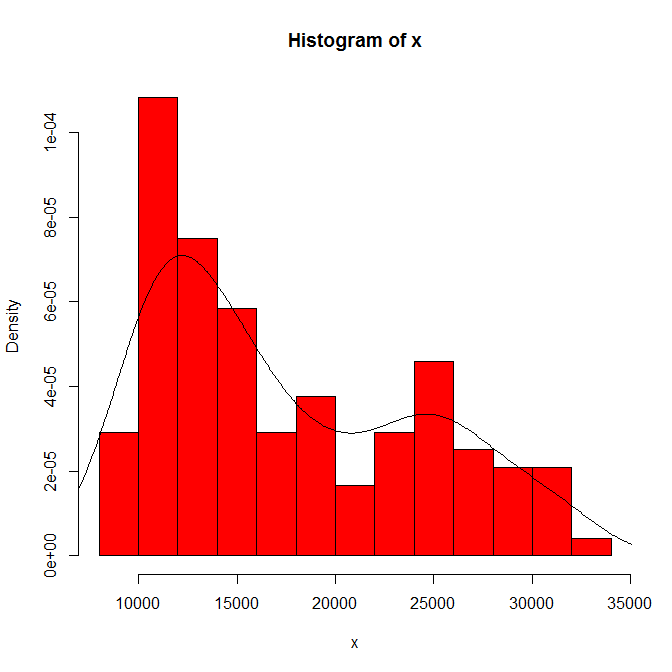 The two sampling distributions barely overlap at all; only .35% of x2.d are less than the maximum x1.d value. 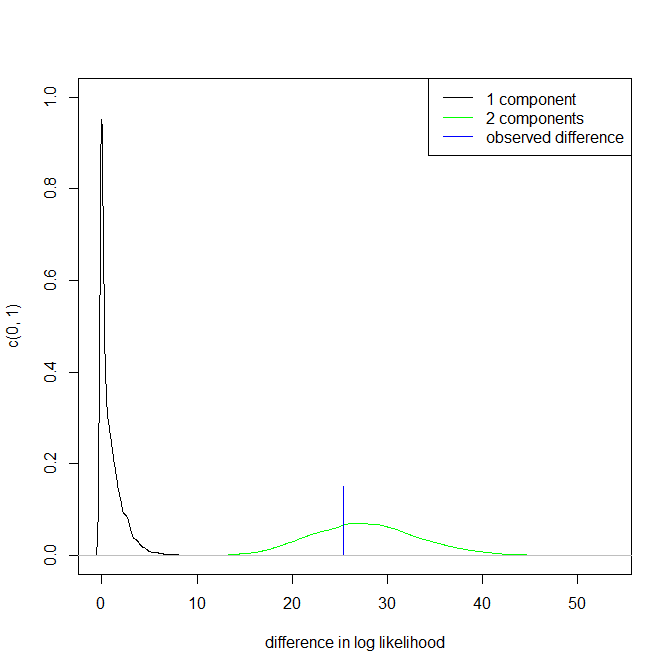 If you selected a two component model if the difference in log likelihood were >9.7, you would incorrectly select the one component model .01% and the two component model .02% of the time. These are highly discriminable. If, on the other hand, you chose to use the one component model as a null hypothesis, your observed result is sufficiently small as not to show up in the empirical sampling distribution in 10,000 iterations. We can use the rule of 3 (see here) to place an upper bound on the p-value, namely, we estimate your p-value is less than .0003. That is, this is highly significant. This raises the question of why these results diverge so much from your dip test. (To answer your explicit question, your dip test provides no evidence that there are two real modes.) I honestly don't know the dip test, so it's hard to say; it may be underpowered. However, I think the likely answer is that this approach assumes your data are generated by true normal[s]. A Shapiro-Wilk test for your data is highly significant ($p < .000001$), and it is also highly significant for the optimal Box-Cox transformation of your data (the inverse square root; $p < .001$). However, data are never really normal (cf., this famous quote), and the underlying components, should they exist, aren't guaranteed to be perfectly normal either. 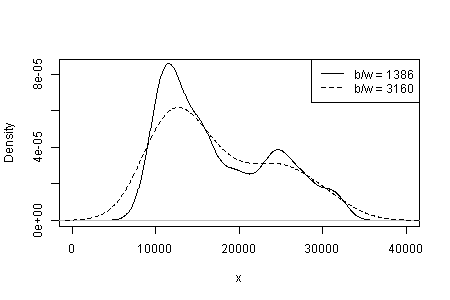 If you find it reasonable that your data could come from a positively skewed distribution, rather than a normal, this level of bimodality may well be within the typical range of variation, which is what I suspect the dip test is saying. 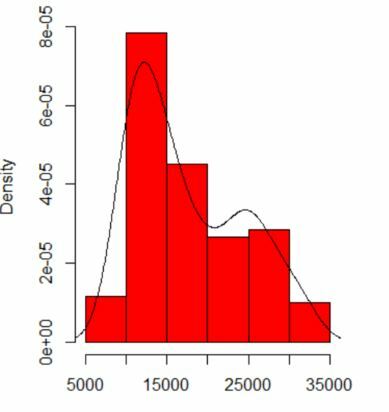 Take this kernel density estimate as the proximal null—the distribution closest to the data yet still consistent with the null hypothesis that it's a sample from a unimodal population—and simulate from it. In the simulated samples the secondary mode doesn't often look so distinct, and you needn't widen the bandwidth as much to flatten it out. Formalizing this approach leads to the test given in Silverman (1981), "Using kernel density estimates to investigate modality", JRSS B, 43, 1. Schwaiger & Holzmann's silvermantest package implements this test, and also the calibration procedure described by Hall & York (2001), "On the calibration of Silverman's test for multimodality", Statistica Sinica, 11, p 515, which adjusts for asymptotic conservatism. Performing the test on your data with a null hypothesis of unimodality results in p-values of 0.08 without calibration and 0.02 with calibration. I'm not familiar enough with the dip test to guess at why it might differ. The size of the dataset. It is not tiny, not large. 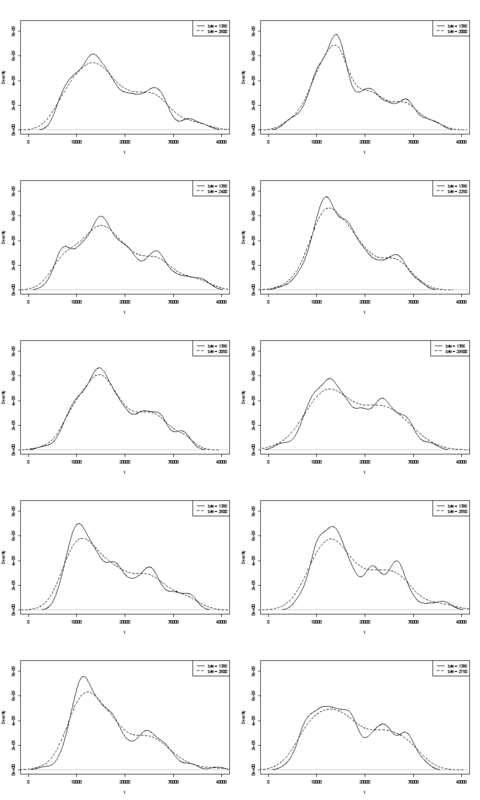 The dependence of what you see on histogram origin and bin width. With only one choice evident, you (and we) have no idea of sensitivity. The dependence of what you see on kernel type and width and whatever other choices are made for you in density estimation. With only one choice evident, you (and we) have no idea of sensitivity. We can't comment on either of those here. One small handle on repeatability is to compare what you get with bootstrap samples of the same size. Here are the results of a token experiment using Stata, but what you see is arbitrarily limited to Stata's defaults, which themselves are documented as plucked out of the air. I got density estimates for the original data and for 24 bootstrap samples from the same. The indication (no more, no less) is what I think experienced analysts would just guess any way from your graph. The left-hand mode is highly repeatable and the right-hand is distinctly more fragile. Note that there is an inevitability about this: as there are fewer data nearer the right-hand mode, it won't always reappear in a bootstrap sample. But this is also the key point. Note that point 3. above remains untouched. But the results are somewhere between unimodal and bimodal. MaxEnt Modes [Red color triangles in the plot]: 12783.36 and 24654.28. 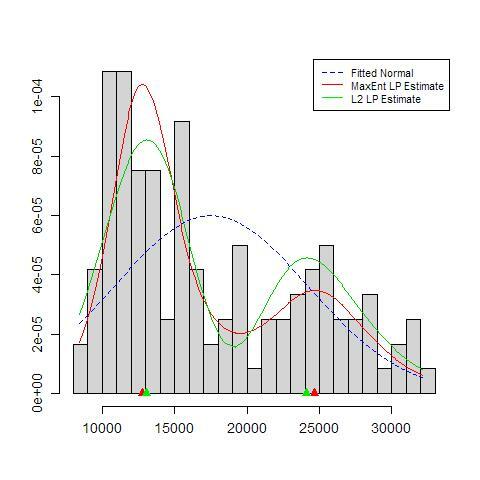 L2 Modes [Green color triangles in the plot]: 13054.70 and 24111.61. Interesting to note the modal shapes, especially the second one which shows considerable skewness (Traditional Gaussian Mixture model likely to fail here). Not the answer you're looking for? Browse other questions tagged r hypothesis-testing distributions self-study histogram or ask your own question. How to tell the probability of failure if there were no failures? Is this a multimodal distribution? Number of components for Gaussian mixture model? How is Poisson distribution different to normal distribution? How to describe/explain the shape of a distribution which has two peaks? Can you test for normality for a (0,1) bounded distribution?